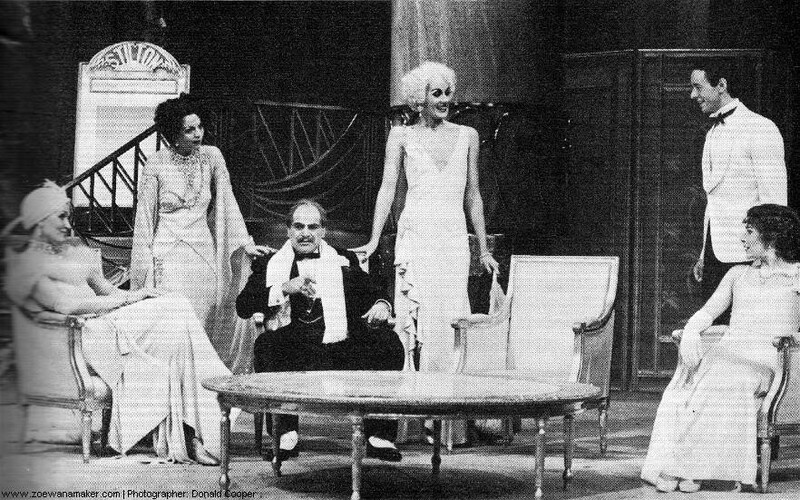 A Royal Shakespeare Company production of a play by Moss Hart & George S. Kaufman, performed at the Aldwych Theatre, London (opened 4 September 1979). The first photo, which is from the Piccadilly run, shows Zoë Wanamaker and another cast member in rehearsal. The remaining photos are from the Aldwych run. 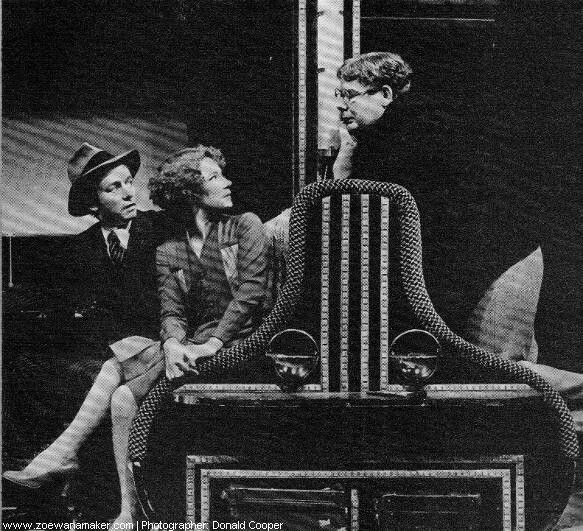 The second shows (from left to right) Jerry Hyland (played by Peter McEnery), George Lewis (Richard Griffiths), and May Daniels (Zoë Wanamaker) struck by the idea of making their fortunes in Hollywood. The third shows Jerry, May, and George on the train for Hollywood. The fourth shows George and May. The fifth shows Florabel Leigh (Cheryl Hall), Phyllis Fontaine (Diana Van Fossen), Herman Glogauer (David Suchet), and Helen Hobart (Gaye Brown), with the new voice coaches, Jerry and May. 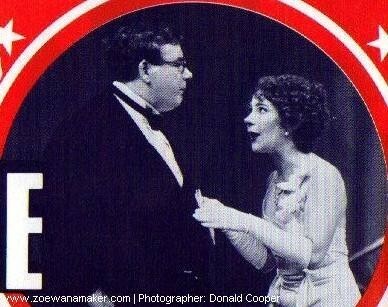 The sixth shows George and May. The introduction of films with sound in the late 1920s encourages three enterprising vaudeville performers, May Daniels, Jerry Hyland, and George Lewis, to leave New York and head for Hollywood in Once in a Lifetime. A chance meeting during their journey leads to the trio being hired by the Herman Glogauer Studio, where May's lack of experience as voice coach quickly becomes apparent. Meanwhile, the rather dim George unexpectedly finds himself the toast of Hollywood with his unorthodox approach to filmmaking. This was the premiere production of Once in a Lifetime in the UK. With its huge cast, the show effectively evoked the excitement and hubbub of the US film industry during the Twenties. Enormously ambitious and successful, the production is well remembered today. In addition to the extremely large number of characters, according to the theatre programme, '[f]irst nighters, reporters, photographers, sailors, showgirls, passengers, beach belles, Schlepkin brothers, extras, etc. are played by pretty much everybody'! When Zoë first read Once in a Lifetime, at the request of director Trevor Nunn, she found that it struck a chord with her American heritage and cultural background. As she told The Times a few years after appearing in the play, 'for the first time in my career I knew I was home; not only geographically, in America, but theatrically too'. Once in a Lifetime is one of the many productions in which Zoe has appeared with the prestigious Royal Shakespeare Company. She joined the RSC at a very interesting stage in its development, sensing an exciting new dynamic among the actors. 'Some of us now at the RSC have a different sort of energy that has not been smoothed, shined or made acceptable. I like that', she commented at the time (see 'I Yearn To Be So Free and Comfortable on That Stage' interview). Her sparkling performance as May Daniels in this production won Zoe the 1979 Society of West End Theatre (now known as Olivier) Award for Actress of the Year in a Revival, as well as the Evening Standard Award for Best Actress. When they worked together on Once in a Lifetime, Zoë was already firm friends with David Suchet. As she has since explained: 'I knew him long before that [production]. We enjoyed working with each other a lot during that period' (see 'Zoe's an Actress with Drive' interview). 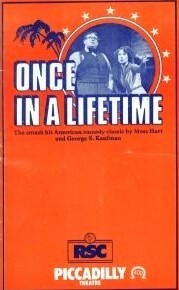 In 1988, they reprised their roles for a TV adaptation of Once in a Lifetime. In addition to Once in a Lifetime, Zoë's RSC productions during the 1970s include The Devil's Disciple (1976), Ivanov (1976), Wild Oats (1976), The Taming of the Shrew (1978), Captain Swing (1978), and Piaf (1978). 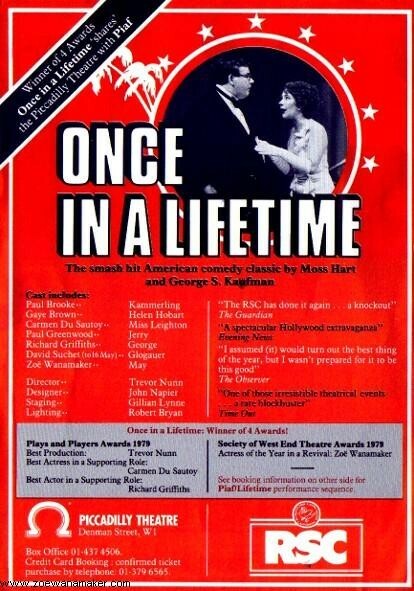 The latter was performed alongside Once in a Lifetime at the Piccadilly, as mentioned on the theatre's flyer. During the 1980s, she returned to the company for Twelfth Night (1983), The Comedy of Errors (1983), Mother Courage and Her Children (1984), and Othello (1989). 'The RSC actors throw themselves into the fray with a will, and the show is a constant joy,' enthused Gordon Gow in Plays & Players. He added: 'Zoe Wanamaker makes much of her choice wisecracks as May and looks a treat in the garb of the period, while striking a most authentic air'. The Guardian summed up the show as 'a knockout'! At the Aldwych, according to the theatre programme, theatregoers could purchase a 'full-colour limited edition poster, specially designed for this production of Once in a Lifetime'. At the Piccadilly, the play's text, posters, and badges were advertised for sale. I believe greetings cards showing costume designs were also available at one or both theatres.